Crouching Tiger, Hidden Dragon (simplified Chinese: 卧虎藏龙; traditional Chinese: 臥虎藏龍) is a 2000 wuxia film directed by Ang Lee and written by Wang Hui-ling, James Schamus and Tsai Kuo Jung, based on the Chinese novel by Wang Dulu. The film features an international cast of Chinese actors, including Chow Yun-fat, Michelle Yeoh, Zhang Ziyi and Chang Chen. Asian Union Film & Entertainment Ltd.
A multinational venture, the film was made on a US$17 million budget, and was produced by Asian Union Film & Entertainment, China Film Co-Productions Corporation, Columbia Pictures Film Production Asia, Edko Films, Good Machine International, and Zoom Hunt Productions. With dialogue in Mandarin, subtitled for various markets, Crouching Tiger, Hidden Dragon became a surprise international success, grossing $213.5 million worldwide. It grossed US$128 million in the United States, becoming the highest-grossing foreign-language film produced overseas in American history. Crouching Tiger, Hidden Dragon has won over 40 awards, and was nominated for 10 Academy Awards, including Best Picture, and won Best Foreign Language Film (Taiwan), Best Art Direction, Best Original Score and Best Cinematography, receiving the most nominations ever for a non-English language film at the time (Roma has since tied this record). The film also won four BAFTAs and two Golden Globe Awards, one for Best Foreign Film. Along with its awards success, Crouching Tiger continues to be hailed as one of the greatest and most influential martial arts films. The film has been praised for its story, direction, and cinematography, and for its martial arts sequences. The film is set in 18th century Qing Dynasty China. Li Mu Bai (Chow Yun-fat) is an accomplished Wudang swordsman and Yu Shu Lien (Michelle Yeoh) heads a private security company. Yu Shu Lien and Li Mu Bai have feelings for each other, but because Shu Lien had been engaged to Mu Bai's close friend, Meng Sizhao, before his death, Shu Lien and Mu Bai feel bound by loyalty to Meng Sizhao and have not acted on their feelings for one another. Mu Bai, after choosing to retire, asks Shu Lien to give his sword "Green Destiny" to their benefactor Sir Te (Sihung Lung) in Beijing. Long ago, Mu Bai's master was murdered by Jade Fox (Cheng Pei-pei), a woman who sought to learn Wudang skills. While at Sir Te's place, Shu Lien makes the acquaintance of Jen Yu (Zhang Ziyi), who is the daughter of rich and powerful Governor Yu and is about to get married. One evening, a masked thief sneaks into Sir Te's estate and steals the Green Destiny. Sir Te's servant Master Bo (Gao Xi'an) and Shu Lien trace the theft to Governor Yu's compound, where Jade Fox had been posing as Jen's governess for many years. Soon after, Mu Bai arrives in Beijing and discusses the theft with Shu Lien. Master Bo makes the acquaintance of Inspector Tsai (Wang Deming), a police investigator from the provinces, and his daughter May (Li Li), who have come to Beijing in pursuit of Fox. Fox challenges the pair and Master Bo (Gao Xi'an) to a showdown that night. Following a protracted battle, the group is on the verge of defeat when Mu Bai arrives and outmaneuvers Fox. Before Mu Bai can kill Fox, the masked thief reappears and helps Fox. Fox kills Tsai before fleeing with the thief (who is revealed to be Jen). After seeing Jen fight Mu Bai, Fox realizes Jen had been secretly studying the Wudang manual and had surpassed her in combat skills. At night, a desert bandit named Lo (Chang Chen) breaks into Jen's bedroom and asks her to leave with him. A flashback reveals that in the past, when Governor Yu and his family were traveling in the western deserts, Lo and his bandits had raided Jen's caravan and Lo had stolen her comb. She pursued him to his desert cave to get her comb back. However, the pair soon fell passionately in love. Lo eventually convinced Jen to return to her family, though not before telling her a legend of a man who jumped off a cliff to make his wishes come true. Because the man's heart was pure, he did not die. Lo came to Beijing to persuade Jen not to go through with her arranged marriage. However, Jen refuses to leave with him. Later, Lo interrupts Jen's wedding procession, begging her to leave with him. Nearby, Shu Lien and Mu Bai convince Lo to wait for Jen at Mount Wudang, where he will be safe from Jen's family, who are furious with him. Jen runs away from her husband on their wedding night before the marriage could be consummated. Disguised in male clothing, she is accosted at an inn by a large group of warriors; armed with the Green Destiny and her own superior combat skills, she emerges victorious. Jen visits Shu Lien, who tells her that Lo is waiting for her at Mount Wudang. After an angry exchange, the two women engage in a duel. Shu Lien is the superior fighter, but Jen wields the Green Destiny: the sword destroys each weapon that Shu Lien wields, until Shu Lien finally manages to defeat Jen with a broken sword. When Shu Lien shows mercy, Jen wounds Shu Lien in the arm. Mu Bai arrives and pursues Jen into a bamboo forest. Mu Bai confronts Jen and offers to take her as his student. She arrogantly promises to accept him as her teacher if he can take Green Destiny from her in three moves. Mu Bai is able to take the sword in only one move, but Jen goes back on her word to accept him as teacher. Mu Bai throws the sword over a waterfall, Jen dives after it, and is then rescued by Fox. Fox puts Jen into a drugged sleep and places her in a cavern; Mu Bai and Shu Lien discover her there. Fox suddenly reappears and attacks the others with poisoned darts. Mu Bai blocks the needles with his sword and avenges his master's death by mortally wounding Fox, only to realize that one of the darts hit him in the neck. Fox dies, confessing that her goal had been to kill Jen because Jen had hidden the secrets of Wudang's best fighting techniques from her. As Jen leaves to prepare an antidote for the poisoned dart, Mu Bai prepares to die. With his last breaths, he finally confesses his love for Shu Lien. He dies in her arms as Jen returns, too late to save him. The Green Destiny is returned to Sir Te. Jen later goes to Mount Wudang and spends one last night with Lo. The next morning, Lo finds Jen standing on a bridge overlooking the edge of the mountain. In an echo of the legend that they spoke about in the desert, she asks him to make a wish. He wishes for them to be together again, back in the desert. The movie ends with Jen jumping off the bridge. The name "Crouching Tiger Hidden Dragon" is a literal translation of the Chinese idiom "臥虎藏龍" which describes a place or situation that is full of unnoticed masters. It is from a poem of the ancient Chinese poet Yu Xin's (513–581) that reads "暗石疑藏虎，盤根似臥龍", which means "behind the rock in the dark probably hides a tiger, and the coiling giant root resembles a crouching dragon." The last character in Xiaohu and Jiaolong's names mean "Tiger" and "Dragon", respectively. Some prominent martial arts styles traditionally were held to have been originated by women, e.g. History of Wing Chun credits a Buddhist nun Ng Mui teaching Yim Wing-Chun the style. The film's title reference to masters one does not notice necessarily includes mostly women, and suggests the advantage of a female bodyguard. Traditional weapons taught in Wing Chun are exactly those easily concealed (butterfly knives) or similar to those taught in Japanese Aikido primarily to women (long pole). The style emphasizes centerline blows to vital areas, as opposed to maiming strikes against limbs, thus seems intended for death blows, knockouts, and tactics generally used by physically weaker opponents seeking to win in a single strike rather than engage in an extended confrontation. Again, the title suggests powerful creatures that strike by surprise. Regarding conflicts in the student-teacher relationship, the potential for exploitation created by the subordinate position of the student and the tensions that exist when a student surpasses or resists a teacher are explored. Jen hides her mastery of martial arts from her teacher, Jade Fox, which leads both to their parting of ways and to Jade Fox's attempt on Jen's life. At the same time, Jade Fox tried to learn Wudang martial arts from Li Mu Bai's master but was refused, even though she tried convincing him by sleeping with him. Poison is also a significant theme in the film. In the world of martial arts, poison is considered the act of one who is too cowardly and dishonorable to fight; and indeed, the only character who explicitly fits these characteristics is Jade Fox. The poison is a weapon of her bitterness, and quest for vengeance: she poisons the master of Wudang, attempts to poison Jen, and succeeds in killing Mu Bai using a poisoned needle. However, the poison is not only of the physical sort: Jade Fox's tutelage of Jen has left Jen spiritually poisoned, which can be seen in the lying, stealing, and betrayal Jen commits. However, Jen is never seen to use poison herself, even though she was trained by Jade Fox. This indicates that she may yet be reformed and integrated into society. In further play on this theme by the director, Jade Fox, as she dies, refers to the poison from a young child, "the deceit of an eight-year-old girl," obviously referring to what she considers her own spiritual poisoning by her young apprentice Jen. Li Mu Bai himself warns that without guidance, Jen could become a "poison dragon". The film was originally written as a novel series by Wang Dulu starting in the late 1930s. The film is loosely adapted from the storyline of the fourth book in the series, Crouching Tiger, Hidden Dragon. 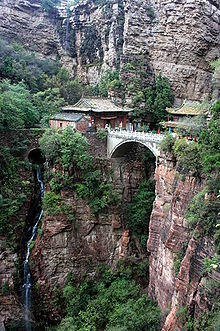 Mount Cangyan, including the bridge pictured above, was one of many filming locations for the film. 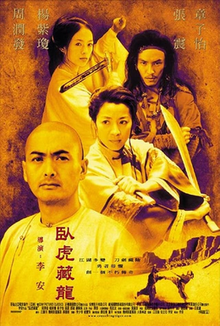 Although its Academy Award was presented to Taiwan, Crouching Tiger, Hidden Dragon was in fact an international co-production between companies in four regions: the Chinese company China Film Co-Production Corporation; the American companies Columbia Pictures Film Production Asia, Sony Pictures Classics, and Good Machine; the Hong Kong company EDKO Film; and the Taiwanese Zoom Hunt International Productions Company, Ltd; as well as the unspecified United China Vision, and Asia Union Film and Entertainment Ltd., created solely for this film. The film was made in Beijing, with location shooting in the Anhui, Hebei, Jiangsu, and Xinjiang provinces of China. The first phase of shooting was in the Gobi Desert where it consistently rained. Director Ang Lee noted, "I didn't take one break in eight months, not even for half a day. I was miserable -- I just didn't have the extra energy to be happy. Near the end, I could hardly breathe. I thought I was about to have a stroke." The stunt work was mostly performed by the actors themselves and Ang Lee stated in an interview that computers were used "only to remove the safety wires that held the actors." "Most of the time you can see their faces," he added, "That's really them in the trees." Another compounding issue was the difference between accents of the four lead actors: Chow Yun-fat is from Hong Kong and speaks Cantonese natively, and Michelle Yeoh is from Malaysia and grew up speaking English and Malay; she learned the Mandarin lines phonetically. Only Zhang Ziyi spoke with a native Mandarin accent that Ang Lee wanted. 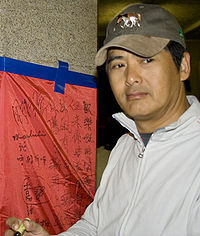 Chow Yun Fat said, on "the first day [of shooting], I had to do 28 takes just because of the language. That's never happened before in my life." The score was composed by Tan Dun, originally performed by Shanghai Symphony Orchestra, Shanghai National Orchestra, and Shanghai Percussion Ensemble. It also features many solo passages for cello played by Yo-Yo Ma. The "last track" ("A Love Before Time") features Coco Lee, who later performed it at the Academy Awards. The music for the entire film was produced in two weeks. Crouching Tiger, Hidden Dragon, which is based on an early 20th century novel by Wang Dulu, unfolds much like a comic book, with the characters and their circumstances being painted using wide brush strokes. Subtlety is not part of Lee's palette; he is going for something grand and melodramatic, and that's what he gets. Crouching Tiger, Hidden Dragon was very well received in the Western world, receiving numerous awards. The review aggregator Rotten Tomatoes reported that 97% of critics gave the film positive reviews, based on 153 reviews with an average rating of 8.6/10. The website's critical consensus states: "The movie that catapulted Ang Lee into the ranks of upper echelon Hollywood filmmakers, Crouching Tiger, Hidden Dragon features a deft mix of amazing martial arts battles, beautiful scenery, and tasteful drama." Metacritic reported the film had an average score of 93 out of 100, based on 31 reviews, indicating "universal acclaim". Some Chinese-speaking viewers were bothered by the accents of the leading actors. Neither Chow (a native Cantonese speaker) nor Yeoh (who was born and raised in Malaysia) spoke Mandarin as a mother tongue. All four main actors spoke with different accents: Chow speaks with a Cantonese accent; Yeoh with a Malaysian accent; Chang Chen a Taiwanese accent; and Zhang Ziyi a Beijing accent. Yeoh responded to this complaint in a December 28, 2000, interview with Cinescape. She argued, "My character lived outside of Beijing, and so I didn't have to do the Beijing accent." When the interviewer, Craig Reid, remarked, "My mother-in-law has this strange Sichuan-Mandarin accent that's hard for me to understand. ", Yeoh responded: "Yes, provinces all have their very own strong accents. When we first started the movie, Cheng Pei Pei was going to have her accent, and Chang Zhen was going to have his accent, and this person would have that accent. And in the end nobody could understand what they were saying. Forget about us, even the crew from Beijing thought this was all weird." Because of movies like Crouching Tiger, Hidden Dragon, Hero, and Memoirs of a Geisha, a lot of people in the United States have become interested not only in me but in Chinese and Asian actors in general. Because of these movies, maybe there will be more opportunities for Asian actors. The film is ranked at number 497 on Empire's 2008 list of the 500 greatest movies of all time and at number 66 in the magazine's 100 Best Films of World Cinema, published in 2010. In 2010, the Independent Film & Television Alliance selected the film as one of the 30 Most Significant Independent Films of the last 30 years. In 2016, it was voted the 35th-best film of the 21st century as picked by 177 film critics from around the world. Film Journal noted that Crouching Tiger, Hidden Dragon "pulled off the rare trifecta of critical acclaim, boffo box-office and gestalt shift", in reference to its ground-breaking success for a subtitled film in the American market. Wu and Chan (2007) look at Crouching Tiger, Hidden Dragon as somewhat of an example of "counter-flow", a film that has challenged Hollywood's grip on the film market. They argue that as a product of globalization, the movie did not demonstrate a one-way flow based on Western ideology, but was multidirectional with the ability of local resources to influence the West and gain capital. Despite its international success and perceived ability to change the flow from East to West, however, there were still instances of Western adaptation for the movie, such as putting more emphasis on female characters to better execute a balance between gender roles in the East and West. The script of the film was written between Taiwan and Hollywood and in translating the film to English, many cultural references were lost, which made maintaining the cultural authenticity of the film while still reaching out to the West very difficult. The thematic conflict throughout the movie between societal roles and personal desires attribute to the international reception of the film, which resonates with both the Eastern and Western audiences. Additionally, international and Western networks were used in the production and promotion of the film, which were needed to achieve its global distribution. Additional marketing strategies were needed for the film to attract the Western audience, who were unfamiliar with the cultural products of the East. The film premiered in cinemas on December 8, 2000, in limited release within the US. During its opening weekend, the film opened in 15th place, grossing $663,205 in business, showing at 16 locations. On January 12, 2001, Crouching Tiger, Hidden Dragon premiered in cinemas in wide release throughout the US grossing $8,647,295 in business, ranking in sixth place. The film Save the Last Dance came in first place during that weekend, grossing $23,444,930. The film's revenue dropped by almost 30% in its second week of release, earning $6,080,357. For that particular weekend, the film fell to eighth place screening in 837 theaters. Save the Last Dance remained unchanged in first place, grossing $15,366,047 in box-office revenue. During its final week in release, Crouching Tiger, Hidden Dragon opened in a distant 50th place with $37,233 in revenue. The film went on to top out domestically at $128,078,872 in total ticket sales through a 31-week theatrical run. Internationally, the film took in an additional $85,446,864 in box-office business for a combined worldwide total of $213,525,736. For 2000 as a whole, the film cumulatively ranked at a worldwide box-office performance position of 19. Gathering widespread critical acclaim at the Toronto and New York film festivals, the film also became a favorite when Academy Awards nominations were announced in 2001. The film was, however, screened out of competition at the 2000 Cannes Film Festival. The film received ten Academy Award nominations, which was the highest ever for a non-English language film, up until it was tied by Roma (2018). The names of the pterosaur genus Kryptodrakon and the ceratopsian genus Yinlong (both meaning hidden dragon in Greek and Mandarin respectively) allude to the film. ^ "Crouching Tiger, Hidden Dragon". British Board of Film Classification. Retrieved 19 February 2016. ^ a b c d "Wo Hu Zang Long (2000)". British Film Institute. Retrieved 6 November 2017. ^ a b c d e "Crouching Tiger, Hidden Dragon (2000)". Box Office Mojo. Retrieved 3 May 2010. ^ "Foreign Language Movies at the Box Office - Box Office Mojo". www.boxofficemojo.com. Retrieved 7 April 2018. ^ Landler, Mark (2 July 2001). "It's Raining Tigers and Dragons; Asian Filmmakers Rush to Repeat an Oscar Winner's Success". The New York Times. ISSN 0362-4331. Retrieved 11 April 2017. ^ "Gem of the (Pacific) Ocean | Film Journal International". www.filmjournal.com. Retrieved 11 April 2017. ^ Caffeinated Clint (18 March 2013). "Yen confirms Crouching Tiger, Hidden Dragon rumours". Moviehole. Retrieved 14 April 2013. ^ "Chinese Dictionary – Crouching Tiger Hidden Dragon". Retrieved 27 June 2013. ^ Fairlamb, Horace L. "Romancing the Tao: How Ang Lee Globalized Ancient Chinese Wisdom," symploke vol. 15, No. 1-2 (2007), p.196. ^ Turner Classic Movies. "CROUCHING TIGER, HIDDEN DRAGON (2000): Original Print Information". Turner Broadcasting System. ^ "Crouching Tiger, Hidden Dragon: Cast & Details". TV Guide. 2000. ^ "Crouching Tiger, Hidden Dragon (2000) -- Production Details". Yahoo Movies. ^ a b c Corliss, Richard (3 December 2000). "Year of the Tiger". TIME. Retrieved 29 June 2011. a top-flight all-Asian cast featuring Chow Yun Fat (Hong Kong), Michelle Yeoh (Malaysia), Zhang Ziyi (Beijing) and Chang Chen (Taiwan). Only one of the stars -- Zhang, then a 19-year-old ingenue -- spoke anything like the classical mainland Mandarin that Lee demanded. ^ Ebert, Roger (20 December 2000). "Crouching Tiger Hidden Dragon". Chicago Sun Times. Retrieved 29 June 2011. ^ "Michelle Yeoh Web Theatre Q&A". ^ "Tan Dun, a Musical Journey Back to Roots". China International Information Center. 2003. Retrieved 24 July 2011. ^ Berardinelli, James (December 2000). "Crouching Tiger, Hidden Dragon". ReelViews. Retrieved 19 December 2011. ^ "Crouching Tiger, Hidden Dragon (1999)". Rotten Tomatoes. Fandango Media. Retrieved 6 March 2018. ^ "Crouching Tiger, Hidden Dragon Reviews". Metacritic. CBS Interactive. Retrieved 6 March 2018. ^ Hu, Brian (December 20, 2006). "An Accent on Acting: An Interview with Gong Li". UCLA Asia Institute. Accessed December 30, 2006. ^ Reid, Craig (December 28, 2000). Crouching Tigress: Michelle Yeoh, Part 2. Mania. Accessed May 3, 2010. ^ "Prince of Persia: Anatomy of a Prince", PlayStation: The Official Magazine 13 (December 2008): 50. ^ The 500 Greatest Movies Of All Time. Empire. Accessed July 27, 2010. ^ "The 100 Best Films of World Cinema". Empire. Retrieved 24 December 2011. ^ "IFTA Picks 30 Most Significant Indie Films". The Wrap. Retrieved 23 January 2017. ^ 23 August 2016 (23 August 2016). "Culture - The 21st Century's 100 greatest films". BBC. Retrieved 1 November 2016. ^ "Gem of the (Pacific) Ocean | Film Journal International". www.filmjournal.com. Retrieved 3 April 2017. ^ a b c d e f g Wu, Huaiting; Chan, Joseph M. (2007). "Globalizing Chinese Martial Arts Cinema: The Global-Local Alliance and the Production of Crouching Tiger, Hidden Dragon". Media, Culture & Society. 29 (2): 195–217. ^ "January 12–14, 2001". Box Office Mojo. Retrieved 19 December 2011. ^ "July 20–22, 2001 Weekend". Box Office Mojo. Retrieved 19 December 2011. ^ "2000 Domestic Grosses". Box Office Mojo. Retrieved 19 December 2011. ^ "Crouching Tiger, Hidden Dragon". festival-cannes.com. Retrieved 17 October 2009. ^ Dicker, Ron (22 January 2019). "'Roma' Ties 'Crouching Tiger' For Most Foreign Film Oscars Nominations At 10". Huffington Post. Retrieved 23 January 2019. ^ "Crouching Tiger, Hidden Dragon: Awards & Nominations". MSN Movies. Retrieved 4 May 2010. ^ "Crouching Tiger, Hidden Dragon (2000)". Yahoo! Movies. Retrieved 4 May 2010. ^ "The Academy of Motion Picture Arts and Sciences". Oscars.org. Archived from the original on 14 January 2012. Retrieved 5 May 2010. ^ "British Academy of Film and Television Arts". BAFTA.org. Retrieved 5 May 2010. ^ "The 6th Critics' Choice Awards Winners And Nominees". BFCA.org. Archived from the original on 4 January 2012. Retrieved 5 May 2010. ^ "Chicago Film Critics Awards -- 1998-07". ChicagoFilmCritics.org. Archived from the original on 15 May 2012. Retrieved 5 May 2010. ^ "2000s -- DGA Award Winners for: Outstanding Directorial Achievement in Feature Film". Directors Guild Of America. Archived from the original on 20 November 2010. Retrieved 5 May 2010. ^ "Crouching Tiger, Hidden Dragon". GoldenGlobes.org. Archived from the original on 4 September 2012. Retrieved 5 May 2010. ^ "Hong Kong Film Awards History". Hong Kong Film Awards. Archived from the original on 18 May 2006. Retrieved 5 May 2010. ^ "26th Annual Los Angeles Film Critics Association Awards". LAFCA.net. Retrieved 5 May 2010. ^ "Awards for 2000". National Board of Review. Archived from the original on 9 February 2009. Retrieved 5 May 2010. ^ "2000 Awards". New York Film Critics Circle. Archived from the original on 26 March 2010. Retrieved 5 May 2010. ^ "TFCA Awards 2000". Toronto Film Critics Association. Archived from the original on 24 March 2010. Retrieved 5 May 2010. ^ "Awards Winners". Writers Guild Awards. Archived from the original on 17 January 2013. Retrieved 5 May 2010. ^ "US-Chinese sequel to 'Crouching Tiger, Hidden Dragon' announced". ^ "Michelle Yeoh to reprise her role in The Green Destiny | News | Screen". Screendaily.com. 16 May 2013. Retrieved 16 May 2013. ^ "经纪人回应章子怡加盟"卧虎2"传闻：李安导一定演". chinadaily.com.cn. 27 August 2013. Retrieved 27 August 2013. ^ Hamedy, Sara (30 September 2014). "Nation's top theater chains won't carry 'Crouching Tiger' sequel". Los Angeles Times. Retrieved 30 September 2014. ^ "Janet Reminisces Over 'All for You,' Slots 'Lover' For Next Single - MTV". MTV News. Reid, Shaheem. 30 April 2001. Retrieved 10 February 2014. ^ "Kryptodrakon progenitor: Earliest Pterodactyloid Pterosaur Discovered in China". Sci-News.com. 24 April 2014. Retrieved 22 October 2014. ^ Xu, X.; Forster, C.A. ; Clark, J.M. ; Mo, J. (2006). "A basal ceratopsian with transitional features from the Late Jurassic of northwestern China" (PDF). Proceedings of the Royal Society B: Biological Sciences. 273 (1598): 2135–2140. doi:10.1098/rspb.2006.3566. PMC 1635516. PMID 16901832.